Denim and leather: mixed these materials are typically associated with youngsters and rock stars. And then if you throw rips into the mix? Surely that's not an outfit you'd be comfortable wearing as a respectable business woman? You're wrong. Jeans are a staple in every wardrobe - everyone needs a good pair of jeans! Running a personal styling business has taught me that most people don't own a good pair of jeans, even if they think they do, they end up loving the pairs I put them in because they fit right. But these are your staple jeans that will last you for ages and can go with everything - how about we throw in some fashion into the mix? 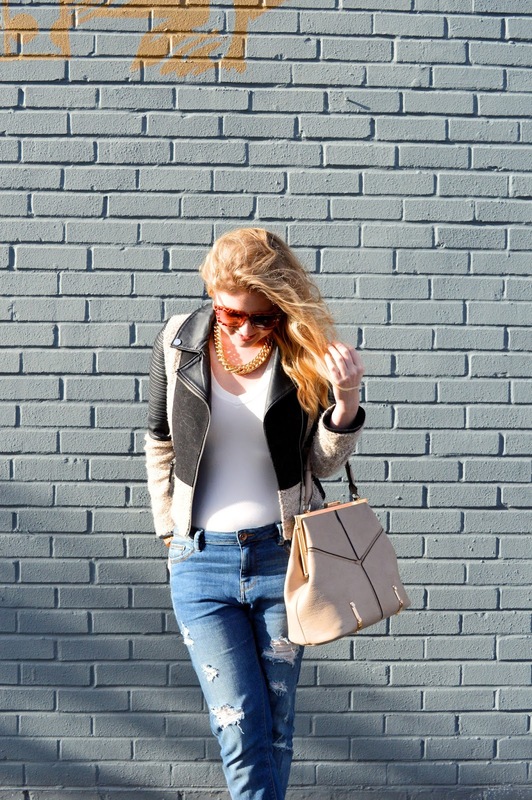 Denim jeans are hot right now and can be worn in a variety of ways - in this post I have styled them with a plain white tee and a faux leather jacket, for a casual cool look. You can play around with fashion items at low cost - spend money on quality items which will stay in your wardrobe for a long time, but if you're ever unsure of a trend you can try it on a budget. Which is why I love Primark. With items costing around the same price as your weekend breakfast at a local garden centre, there's no excuse not to treat yourself to an item which will push you out of your comfort zone and make you look (and feel) great! I paired these jeans with a simple white tee, a leather jacket with taupe detail to soften the look, and taupe ankle boots. I love these JustFab boots - they are so comfortable! And this is the kind of outfit I would wear on a weekend, or if I'm not meeting clients during the day - perks of being a freelancer is that I can wear whatever I want, but most creative environments are now allowing jeans in the office. You can quickly swap this outfit to be more suitable for cocktails by switching the boots to pointed toe heels, adding a statement necklace, and adding a longline blazer; or for a super casual look swap the boots for trainers, and add a big wool scarf to wrap around your neck!